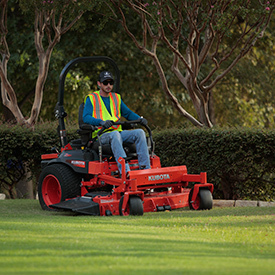 Kubota’s added three new Electronic Fuel Injection (EFI) models to its popular Z700 Series at this year’s GIE+Expo, bringing a total of nine mowers to the line. The Z700 Series is powered by Kohler Command Pro engines and Kawasaki’s industry-proven FX and FX EFI engines, engineered to ensure superior results. Each model features a durable eight gauge steel 48-, 54- or 60-in. deck, six inches deep, allowing for outstanding stability and an efficient, high quality cut. The Z700 Series offers unmatched ergonomics with a wide operator station, a premium adjustable suspension seat for comfort and reduced fatigue during long jobs. The Z700 Series is engineered to create outstanding results and the EFI models offer exceptional performance in challenging conditions.